What is in a name? This was a question I asked many times. I wrote this about five months ago " Here is my advise to Caribbean artist. Register your name as a website. Don't just use myspace.com. As your popularity rises so will you website. Here is an example, beenie man does not own beenieman.com. Do you know the millions of people who go to that website daily. if beenie man register beenie-man.com this will be a less desirable name. Most people do not think beenie man with a slash (-) in the name. This is bad for the marketer who is trying to promote beenie man products or music. Hope this was helpful. Big ups to Machel Montano for getting a head of the game." It is five months later, our CEO is preparing to join Fuzion movement in NYC. 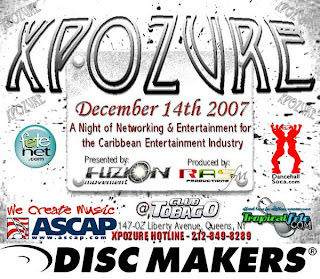 I am pretty sure he will be discussing domain with the new Caribbean artist who will be in the building. The cost of a name can be between $6 and $10 a year. The example given above about beenie man is a great example. If you are a artist and do not understand the power of owning your own domain literally and figuratively. You are not ready to be a serious artist. Here is my equation for connecting the domain dots. New artist + myspace= exposure. New artist + myspace + own domain (website) + hard work = greater visibility and the ability to bring audience from myspace a domain you do not own to a domain you own. There is also the added benefit of return customers and build fan base.